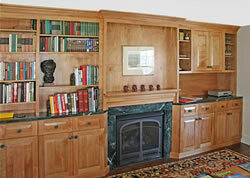 Vermont Woodland Cabinets creates original works of art in the Vermont tradition. We are a source for custom wood furniture and other handcrafted wood art for your home, office or business. We offer custom work for those with very specific size and design parameters, and will build to your expectations. Formal pieces, commemorative furniture and reproductions are all within the scope of our talented craftsmen. We build armoires, wardrobes, coffee tables, entertainment centers, blanket chests, and anything you can describe or sketch on paper.